Following the closure of the Tarves doctors’ surgery, the building in Tarves Square was put up for sale by Haddo Medical Group. 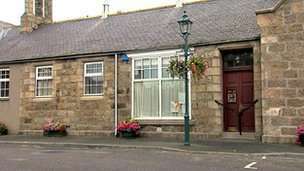 In a surprise move, encouraged by Tarves Community Council, it was bought by a local resident dubbed ‘a community business angel’ who was supporting and enabling the community to acquire the property and keep an important building economically and socially active within the centre of the village. The Community Council helped set up the Tarves Development Trust (TDT) to take forward the project, following a meeting set up by local Aberdeenshire Councillor and resident Paul Johnston with the Development Trust Association Scotland. “Many people had been talking for a while about what the building could be used for. Some informal talking had taken place but initially there were no community groups in a position to take on the building and raise all the necessary money.” said Bob Davidson, Chair of the Community Council. The TDT asked for proposals from the community, then raised over £50k to transform the building into the preferred option – a community cafe and meeting room. Local couple Gill and Alfie Gray opened the Murly Tuck for business in April 2017 and it has been very well received by the local community and also visitors to the village. The Trust is now putting plans in place to secure the long-term future of the Murly Tuck – watch this space !